Anyone watching the reboot of Survivorman? I caught the second part of the Norwegian mountain episode last night. I liked that he took a direct shot at Bear Grylls. "It's not about being a stunt man. It's certainly not about running around, jumping up and down, and diving into frothing gorges or anything like that. The reality of survival is slow, easy, methodical..., calculated risks..., then you come out alive. And that's just what it's all about." I always preferred Les over Bear. I've always enjoyed his show. I did not realize they did a reboot. Thanks for the heads up. Yeah it's pretty good. He's staying out for 10 days now, and I like that they are making him hump HD gear too. I missed it, but I'll have to catch it online or something. Survivorman is my favorite, I thought Bear Grills was OK, but he was definitely all about the drama. Glad to see the real deal is back. (09-11-2012, 06:35 AM)Camper Wrote: I missed it, but I'll have to catch it online or something. Survivorman is my favorite, I thought Bear Grills was OK, but he was definitely all about the drama. I like both Les and Bear. Grillis is a show off and an attention whore, sure, but he is also ex SAS and very much the real deal, even if his show isn't. lol. Facing down waves of zombies, i'd much rather have Grillis at my back. (09-11-2012, 07:46 AM)Valorius Wrote: Facing down waves of zombies, i'd much rather have Grillis at my back. I think he'd be too busy trying to piss on them, drink his own piss, or squeeze piss out of them to drink. 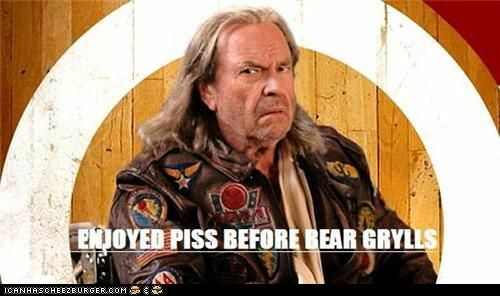 His piss fetish I found to be disturbing. (09-10-2012, 07:43 PM)JustinHEMI Wrote: I always preferred Les over Bear. I agree, I much prefer watching Les on tv than Bear. I actually find Les's show relaxing to watch. However, Bear certainly has my respect. And he openly admits to putting himself in extreme situations just to demonstrate certain skills. I gotta agree that watching survivor man when you're drowsy and drifting in and out is a good way to spend an afternoon.